Anthropogenic activities which are common to urban areas generate a range of physical, chemical and biological pollutants which are subsequently incorporated in stormwater runoff, leading to the deterioration of receiving water environments. This poses risks to both human and ecosystem health including carcinogenic and neurological effects and the loss of aquatic biodiversity. Water environments are an essential asset for enhancing urban liveability. Significant research has been undertaken in relation to stormwater pollutant characterisation and pollutant processes, which forms the baseline knowledge for developing effective stormwater pollution mitigation strategies. 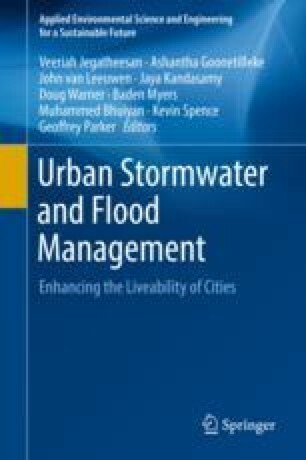 The current practice of formulating strategies to improve stormwater quality relies on the fundamental understanding that pollutants accumulate on urban surfaces during dry weather periods and are subsequently washed-off during rainfall. However, there are significant gaps in the current knowledge base in relation to how pollutant load and composition could vary temporally and spatially, which is critical for understanding the dynamic nature of stormwater quality in urban catchments. This acts as a major constraint to informed decision-making in the context of designing effective stormwater pollution mitigation strategies. Moreover, climate change is a significant influential factor in relation to urban stormwater pollution. The predicted changes to dry and wet weather conditions would lead to changes to pollutant accumulation on urban surfaces, change pollutant characteristics and increase the likelihood of discharging shock loads of pollutants to receiving waters. Research is needed to understand the complex mechanisms underpinning pollutant processes and their influential factors and the role of climate change in order to enhance the well-being of urban communities.